We know how to make customers come back again and again at Fancy Bagels. We've been doing it for 28 years and we welcome newcomers as well as our loyal customers. We have two stores going strong, the original location in Farmington and the newest one in Southington. A clean dining area with tables and chairs is available in each location, yet a great deal of our business consists of takeout orders. Whether you eat and drink on the premises or take your order to the office or park, your experience will be a pleasant one. All of our bagels are freshly made daily and we use premium deli products on our sandwiches. Fresh panagels and pitas are available, too. We know one customer's taste is different from the next person's and good service is one of the quality ingredients. The staff is always willing to serve up any combination of the products we carry. We have a full breakfast and lunch menu with plenty of room for flexibility. At Fancy Bagels, we realize that having a great tasting beverage is as important as serving high quality food. 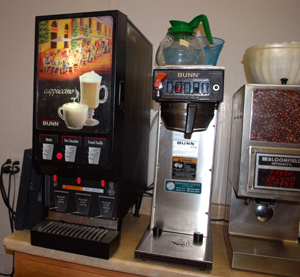 The self-service coffee pots at our coffee stations cater to many tastes. Regular coffee, decaf, and gourmet flavored coffee are hot and all you need to do is fill your cup. For those who prefer cold beverages, we have a cooler with bottled juice, milk, iced tea and water. What's more, we have a cappuccino machine for those who enjoy drinking cappuccino or hot chocolate. At the beginning of December co-owner Salvatore Belcaro was pleasantly surprised by a message that was submitted through this website. When Salvatore lived in Italy, he had a good friend named Giovanni. They haven't been in touch with each other for more than 20 years. Giovanni still lives in Italy and "found" Salvatore on this website. Dominick Gualtieri, also co-owner of Fancy Bagels, feels very happy for both of them. 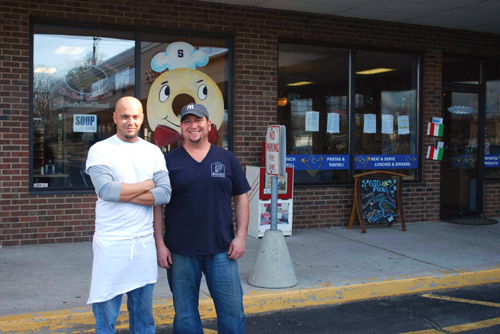 Fancy Bagels has been a family owned and operated eatery business since 1988. It started in Farmington, then expanded to Southington. 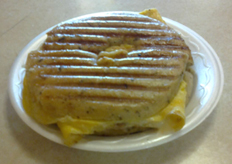 This is one of our Panagel sandwiches. As shown, a bacon, egg and cheese on a spinach Panagel. Every sandwich is made to order. They're all so delicious! Hot Drinks in Addition to Coffee at Fancy Bagels! 2 Great locations where you'll always find a FANCY smile! Stop in and become part of our Fancy Family & Southington still serves Burgers & Fries! Don't forget to stop in and check out the new setup at our Southington location. We combined Fancy Bagel and Fancy Burger into 1 restaurant. More space, bigger grills, faster service, and a more enjoyable experience! See you soon! There's Magic In Every Fancy Day!